After 6 months running together, it has come the time to retire the old Saucony Triumph 8 running shoes and start using the new Saucony Triumph 9. 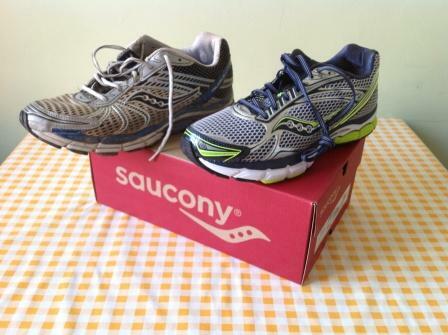 Saucony’s: old Triumph 8 and new Triumph 9. Let this short post be a tribute to the Triumph 8s, which have run to date over 770km, in several cities and countries, and including 6 races, among them a marathon and a half-marathon. A similar curriculum awaits the Triumph 9 pair: several races including 2 marathons and no less than 700 km in a few months. Triumph 8s will live side by side with the 9s, as casual sport shoes from now on, instead of running shoes.